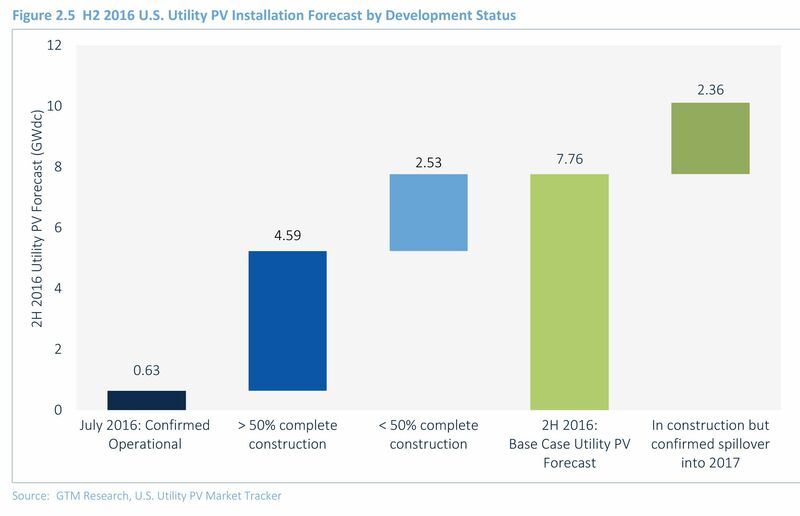 Utility-scale PV will dominate U.S. solar into next year, but the market’s drivers are rapidly evolving. 2016 is slated to be the biggest year ever for solar installations in the U.S., even though more than 2 gigawatts' worth of utility-scale solar projects have been pushed into next year. 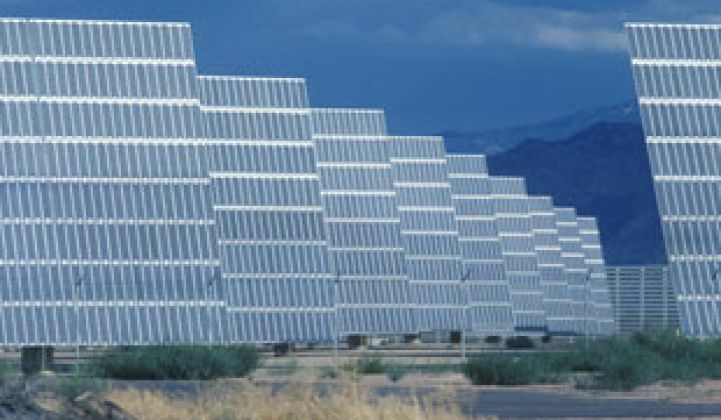 “We’re still going to have the biggest year on record by far, but it’s less than what we were predicting,” said Colin Smith, solar market analyst at GTM Research. Utility-scale solar PV will make up nearly two-thirds of total PV installations for this year, according to GTM Research’s latest Solar Market Insight report. The extension of the federal Investment Tax Credit at the end of 2015 provided some much-needed certainty for the solar industry, as well as some breathing room for utility-scale solar projects that developers were rushing to complete before the expiration. The increase in solar installations for 2016 and 2017 is significant. The nearly 2.5 gigawatts of utility-scale solar that will be pushed into 2017 equates to roughly half the amount of all the utility solar installed in 2015. The spillover effect prompted GTM Research to revise its 2016 solar installation forecast to 14.5 gigawatts, down from about 18 gigawatts before the ITC extension was passed. Before the ITC extension was confirmed, some utility and commercial projects were slated to come on-line this year, but they weren’t scheduled to be delivering power under contract until 2017 or even 2018. Now some of those projects have moved up their start dates to better align with the start date of the power-purchase agreement. In other cases, developers are taking on the incremental cost of delaying some projects until 2017 or even 2018 rather than trying to manage too many projects in 2016. “Now they’re able to keep a lot more projects afloat,” said Smith. Although 2016 is positioned to be a banner year for solar installations, 2017 won’t be far behind, also largely due to utility-scale PV. Spillover is part of the reason that 2017 is forecasted to be a strong year, though there are other drivers for large solar projects as well. Before the ITC extension, investor-owned utilities were rushing to procure solar to meet renewable portfolio standards, explains Smith. “But we’ll see a lull in RPS-driven contracts,” he added. In some states, corporate procurement will drive large solar projects in coming years, while in California, community choice aggregation could push the market further. For the first time ever, community solar is expected to drive at least 100 megawatts annually in the next few years. At GTM’s upcoming Solar Market Insight conference, panels will discuss everything from hot markets for utility solar, to the shifting drivers for both utility and corporate procurement, to the immediate challenges of realizing the promise of community solar. On the utility side, some utilities are signing solar because it’s just good business, as can be seen in states such as Georgia, Florida and Texas. Voluntarily procured projects are now nearly 30 percent of the utility solar pipeline. In a handful of states, the Public Utility Regulatory Policies Act is driving utility projects. PURPA requires utilities to procure energy from small-scale renewable energy projects if it is priced at or below the cost of building additional power themselves. Depending on local conditions, including PPA pricing methodology and power pricing, PURPA is only driving solar in a few states such as North Carolina, South Carolina, Indiana and Oregon. In other states, such as Montana and Utah, PURPA rates have been curbed, which has impacted solar. Rules around PURPA are also making it possible for co-operative and municipal utilities to procure more clean energy if their generation provider is not meeting their needs. Earlier this year, FERC upheld a ruling that electric co-ops can indeed buy power from any qualified facility without having extra fees imposed upon them, meaning that more generation and transmission cooperatives will have to produce more solar -- or some distribution co-ops will likely pursue the development of community solar. Join GTM Research for its 6th Solar Market Insight conference October 25-26 in San Diego to find out more about the changing drivers for the more than 14 gigawatts of solar PV that will be installed this year, and how those drivers are shifting the residential, commercial and utility-scale landscape in 2017 and beyond. Register here.